Freddy Walsh is a Dublin-born guitarist, drummer and composer. Under the tuition of Michael O’Toole, he is a graduate of Waterford I.T and NUI Maynooth, completing a BA in Music, and MA in Performance & Musicology respectively. 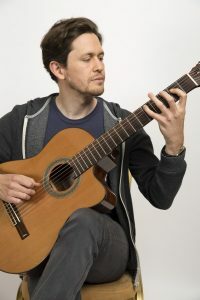 Specialising in classical guitar performance, Freddy performs extensively in numerous venues across the country. His influence at the hands of rock and blues is such that he has also performed on drums in several cover bands and original projects. Continuing his studies of the guitar, Freddy is currently studying jazz guitar with Berklee tutor Tommy Halferty. As well as teaching with Music Generation Wicklow, Freddy also teaches guitar with Music Generation Carlow, and guitar and drums with Clonee Music Tuition Centre.